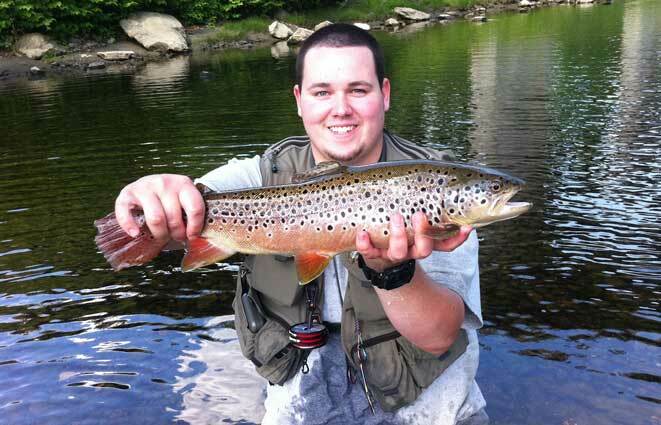 Matt Lavallee of Winooski holds up a brown trout he caught in the Winooski River during a recent Vermont trout season. Trout stocking is underway across the state of Vermont, meaning increased opportunities for anglers. The Vermont Fish & Wildlife Department has started its annual fish stocking work, an effort that will ultimately put over 1,000,000 adult fish, fry and fingerlings–including over 18,000 trophy trout—into Vermont waters in 2015. A key component of the program is the trophy trout initiative, which has been fully restored for 2015 with the reestablishment of the trophy brook trout program. “Vermont is fortunate to have many rivers, lakes and ponds which support naturally reproducing trout populations, including everything from small upland streams and beaver ponds that support abundant wild brook trout to larger rivers which hold wild brown and rainbow trout, as well as large cold-water lakes with wild lake trout” said Rich Kirn, fisheries biologist with Vermont Fish & Wildlife. In addition to the trophy trout, Lake Champlain is scheduled to be stocked with over 434,000 landlocked Atlantic salmon, steelhead rainbow trout, brown trout and lake trout–including fry and fingerlings. Over 230,000 yearling landlocked Atlantic salmon and brook, brown, rainbow and lake trout, as well as steelhead rainbow trout, will be stocked into Vermont streams, lakes and ponds other than Lake Champlain. Lake and pond stocking will begin as soon as ice starts to clear, while river and stream stocking generally occurs in late April and May, after spring flows have receded and temperatures are more conducive to fishing. However, anglers are advised to keep in mind that stocking dates may be subject to change based on weather and water conditions. Miller also noted the role trout have in the substantial economic impact of fishing in Vermont. “Collectively, wild and hatchery-reared trout provide a diverse recreational trout fishery and make a significant contribution to the $131 million expended annually on fishing in Vermont,” said Miller. “Stocked fish alone generate roughly $31.6 million annually for Vermont’s economy through angler expenditures, while costing only $3.3 million to raise. Fishing really is a vital component of Vermont from a variety of angles. For a complete 2015 stocking schedule, to purchase a fishing license or for more information on fishing in Vermont, visit www.vtfishandwildlife.com.